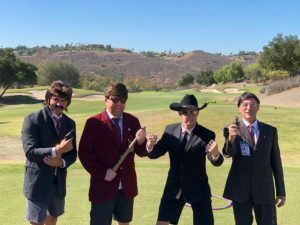 One hundred twenty-eight golfers and over 50 Hensel Phelps volunteers teed off for a cause at the Maderas Golf Club in Poway, California on October 31, 2018. 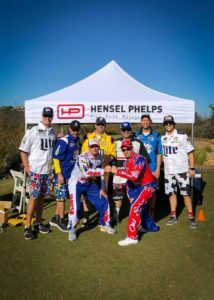 Presented by title sponsor Flood & Peterson, the Hensel Phelps Annual Halloween Charity Golf Tournament was made possible by generous support from all participants, raising over $110K. Proceeds from the event will benefit the La Jolla Family House in San Diego. In addition to Flood & Peterson, other major sponsors were ACCO Engineered Systems, Berg Electric, Brady SoCal, California Sheet Metal, Cosco Fire Protection, Dynalectric, Helix Electric, Inc., Lankford & Associates, Morrow-Meadows Corporation, Pacific Coast Glazing, Inc., Pacific Coast Iron, and Pan-Pacific Mechanical. 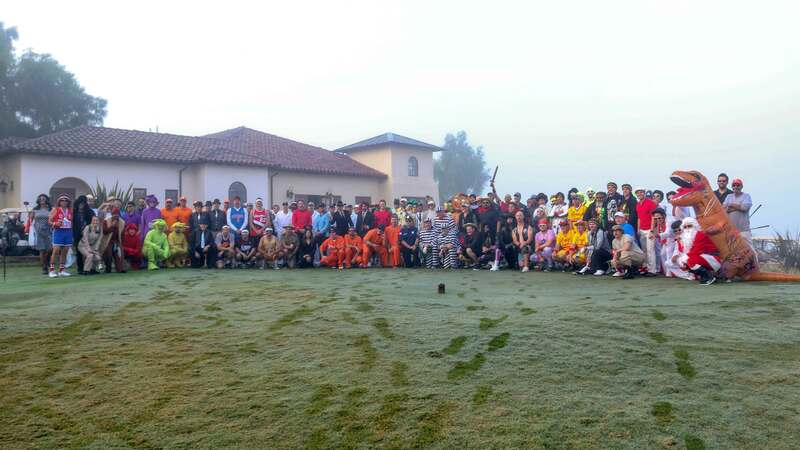 With the mission of “complete player experience,” Hensel Phelps, Maderas Golf Club, and golfing participants arrived before sunrise in Halloween costumes and were greeted with breakfast burritos, coffee, and a Bloody-Mary bar. Upon registration, the participants were given a generous voucher for Under Armour and Titleist swag where hundreds of different golf items such as golf bags, polos, socks, and hats were on display. The participants teed off at 8 a.m. sharp. Along the course were themed and interactive stations where the golfers could get to know Hensel Phelps and participate in an array of activities that included Star Wars themed drone racing, NASCAR themed RC Car racing, a camouflage themed nerf gun competition, dice games, and life-sized golf pong. Prizes were given for Best Team Halloween Costumes, Longest Drive and Closest to the Pin contests, best overall score, and a new category–most honest score. Hensel Phelps held a raffle, offering 35-prizes with a value of over $10,000. In addition to raffles, there were tiered prizes for each sponsorship level including koozies, ProV1’s, Callaway Hats, PitchFix Divot Tools, and socks from Bombas. A heartfelt thank-you goes out to the sponsors and volunteers who helped make this charity golf tournament a successful fundraising event. The La Jolla Family House at UC San Diego Health will be a second home away from home for families with a loved one undergoing long-term or critical care at UC San Diego Health. This new house will become part of a healthy‐living community within walking distance of our hospitals and medical facilities in La Jolla. Our guests will experience a collaborative environment that includes graduate student housing, fitness centers, and affordable dining options. The La Jolla Family House will be a five-story building offering 42 units featuring community lounges, kitchen and dining rooms, 15 furnished apartments, supportive services, and a healthy garden to promote tranquility and rejuvenation during a stressful life event. Our first house, the Bannister Family House in Hillcrest, opened in 1994 thanks to a generous donation from the late Ralph Bannister. More than 5,500 families from around the world have stayed with us in Hillcrest, and we look forward to hosting even more families when our second house opens in La Jolla in 2020. La Jolla Family House is a nonprofit 501(c)(3) that relies heavily on donations from individuals, community organizations, and businesses to ensure that it remains a haven of hope and comfort for families with a loved one in the hospital. (Tax ID #95-2872494). To learn more about Hensel Phelps and their community events visit www.henselphelps.com.